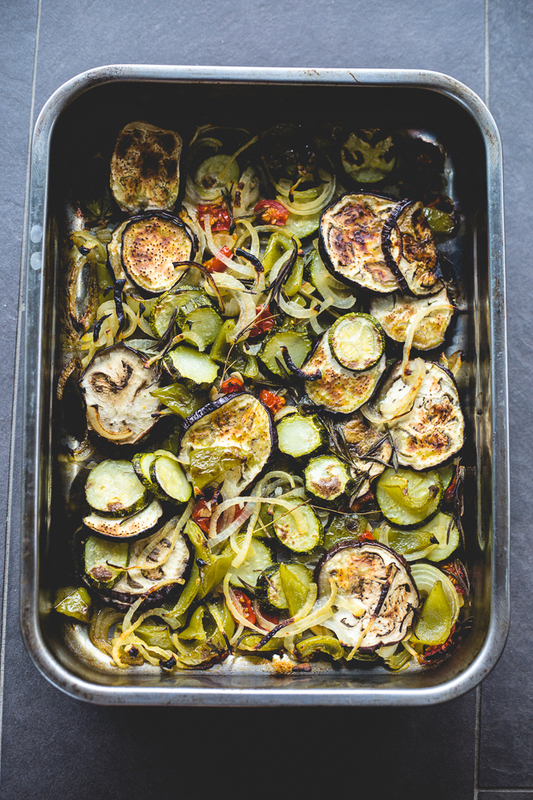 Put all the beautiful summer vegetables in a dish and bake it. The end. Preheat oven to 350°F. Combine first eight ingredients in an ovenproof dish. (Keep herb sprigs intact.) Drizzle with oil and season with salt and pepper. Cover with foil and bake 45 minutes. Remove the foil and bake for another 30-45 minutes until deep golden brown. Remove herb sprigs. DO AHEAD: Will keep for 3-4 days refrigerated; this is super delicious cold and improves with a little time.